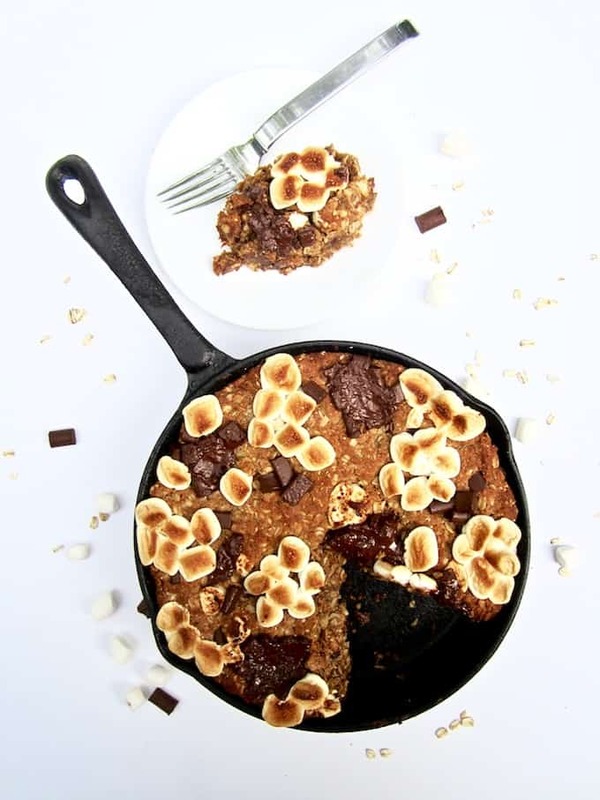 This vegan and gluten free thick cookie cake is a hybrid between oatmeal bars and cookies, with chocolate chunks, marshmallows, oats, coconut flour and flavorful hints of cinnamon, nutmeg and ginger. A new spin on an old American classic, perfect for summer or anytime of year! You know how almost all of my recipes are healthy? Well… this one isn’t at the top of that list, though it’s not totally over the top unhealthy either. It’s definitely better than the average dessert out there, just like these Pumpkin Chocolate Chip Muffin Top Cookies + Coconut Frosting I made last fall (which you should totally check out if you’re a pumpkin lover like me!). But hey, America is having a birthday and that’s reason to celebrate, right? ? ? ? When I think of classic American desserts, S’mores make it on my top 3 list (along with Apple Pie and Classic Chocolate Chip Cookies… oh yea, and Key Lime Pie, and Cheesecake, and Carrot Cake… oh, and some Pecan Pie… ok, apparently we Americans love our desserts, but S’mores are definitely up there as a classic!). Put it together, and there you have it – the Epic S’mores Cookie Sandwich. I have a photo of him indulging in this masterpiece, but David, I’ll spare you the embarrassment, haha! Truthfully, I was always jealous of his teenage boy metabolism… I did not receive that same blessing! ? I don’t actually like marshmallows that much. 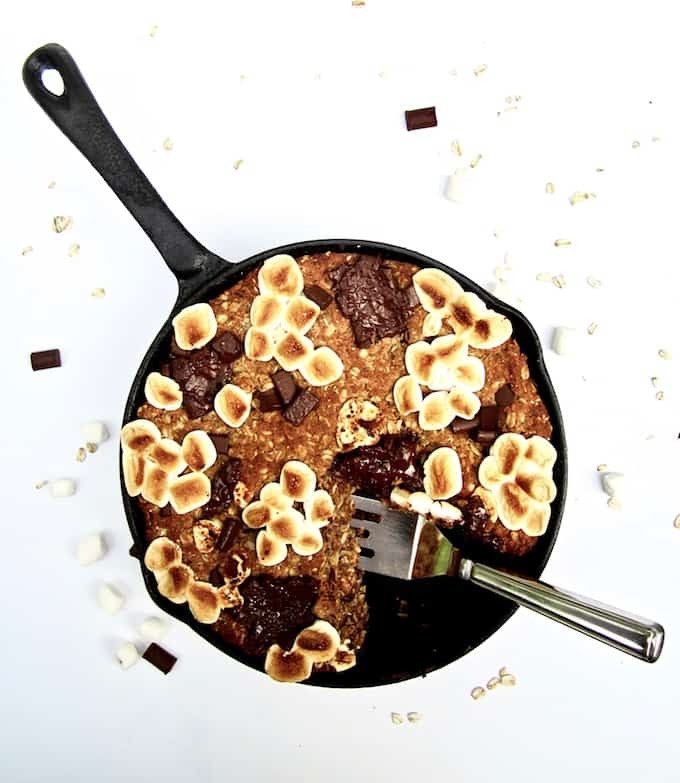 They’re ok, but I never think about them or crave them… except when it comes to this newly created, quickly-became-enamored-with S’mores Oatmeal Cookie Skillet Cake. 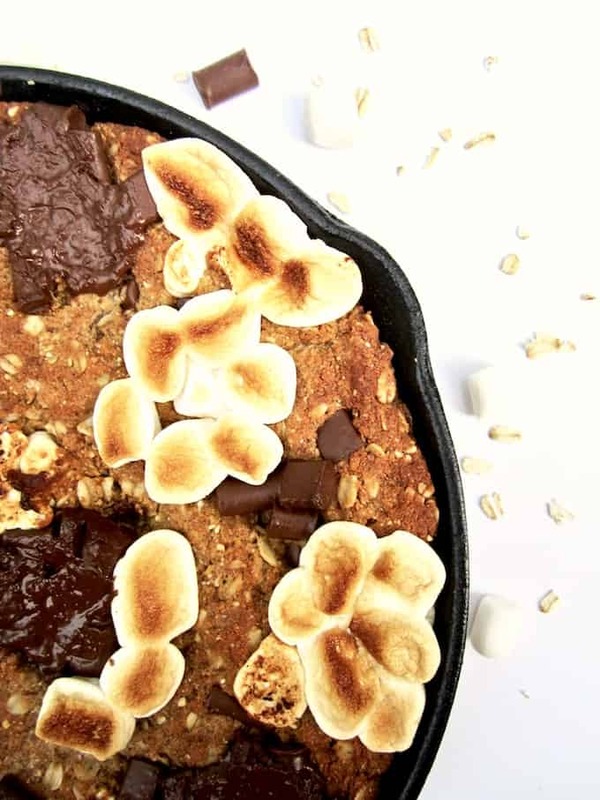 I was recently inspired to make this dessert from a S’mores oatmeal bar that my brother-in-law got at our favorite coffee shop when we were visiting Hawaii called Kayas, an almost all vegan and gluten free cafe with a truly irresistible desserts and baked goods display. 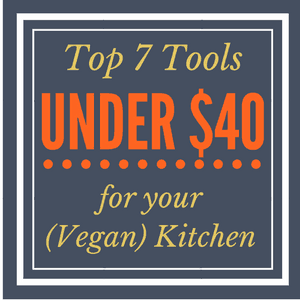 Definitely some of the best vegan + GF treats I’ve had! I kept thinking about how I wanted to make a version of those bars for my blog for the right occassion, so wah-lah – a couple months later, here we are! This version is made in a 9″ cast iron skillet, though I’m sure you could substitute an equivalent sized baking dish – I used the cast iron mostly for presentation. By the way, did you know that most marshmallows are NOT vegan/vegetarian? They contain gelatin, which is derived from the collagen inside animals’ skin and bones. It is commonly used as a gelling agent in food, pharmaceuticals, photography, and cosmetic manufacturing. For this recipe, I used Dandie’s Vegan Vanilla Marshmallows (all natural too – no corn syrup, yay!) which I found at Earth Fare. Trader Joe’s brand of marshmallows are also vegan. This thick cookie cake has warming flavors of cinnamon, ginger and nutmeg, and is best served warm (in my family’s collective taste tester opinions). It’s good room temperature, but it’s EXTRA fabulous when warmed up (it reheats well in the oven), especially with some coconut whipped cream or vegan ice cream on top! Thank you America for having a birthday so I can celebrate with delectable desserts! *Cue music for the Star Spangled Banner* ?? So even though we don’t know for sure whether the Girl Scouts were the first to make “some mores,” no one else has claimed to have invented them. We also don’t know when the name got shortened to “s’more” as recipes for “some mores” appeared in Girl Scout publications until at least 1971. Happy 4th everyone! I hope your festivities are fun and delicious! In a bowl, combine the oats, coconut flour, salt, baking soda, cinnamon, ginger and nutmeg. 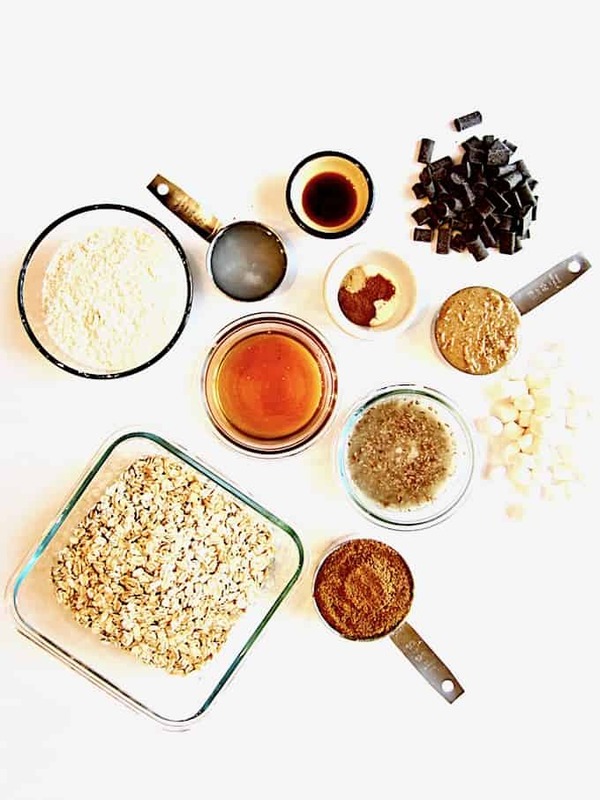 In a separate large bowl, whisk the coconut oil, coconut sugar, maple syrup and peanut butter. Stir in the flax egg and vanilla. Add wet ingredients to the dry ingredients, stirring to combine. Fold in 1/2 cup of the chocolate chips and 1/2 cup of marshmallows. Lightly oil your cast iron skillet (or baking dish) with coconut oil. Gently press the dough evenly into skillet. Top with remaining 1/4 cup chocolate chunks and 1/2 cup marshmallows. I like to group the marshmallows and chocolate chunks into clusters so when they melt, the clusters get all gooey and chewy. Before removing from the oven, broil for 1 - 2 minutes to toast the marshmallows - be super careful not to burn them! Optionally top with coconut whipped cream or vegan ice cream! This is such a fun idea! I just looked up Kaya's, and it made me want to go to Hawaii more than ever now!! Thanks Nicole! Ha, yes, Kaya's totally rocks and is reason enough to get to the Big Island, LOL! ;) Definitely give it a visit if you ever go there! Can i use something other than coconut flour? Hi Heidi - I haven't experimented with other flours but you could try almond flour or perhaps a standard all purpose flour? Let me know how it turns out if you do! This looks so flavorful!! 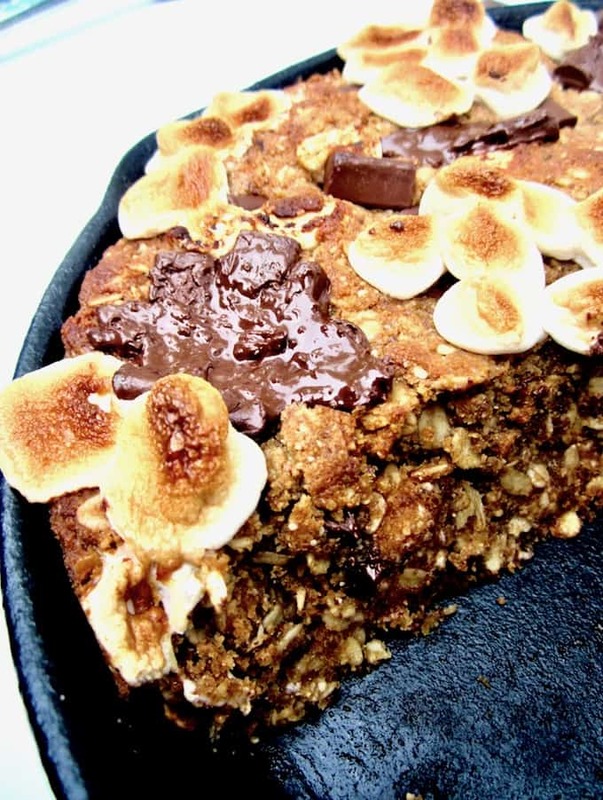 I love skillet desserts!! Thank you Marlena! 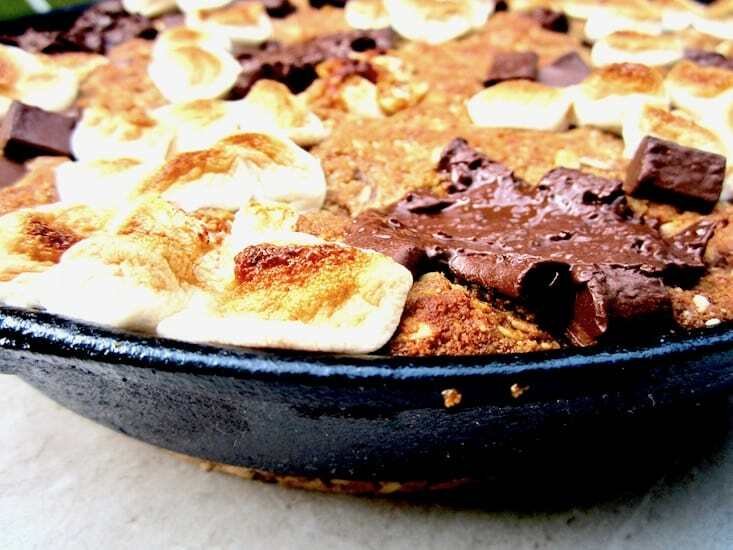 It was my first ever skillet dessert believe it or not, but I loved it so will definitely be making more! OMG. This is amazing! 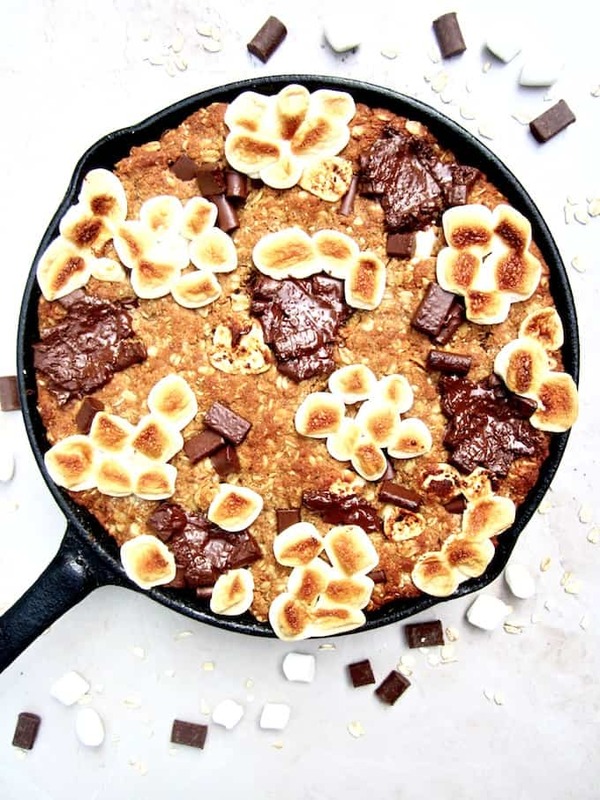 All my favorites all together in one skillet! Do you have the nutritional facts on this? This looks great!